Pittsburgh Mayor Bill Peduto talks at a news conference the day after the Tree of Life synagogue shooting in Pittsburgh, Pennsylvania, October 28, 2018. Authorities investigating the mass shooting at a Pittsburgh synagogue that left 11 people dead are calling the mayhem a "hate crime," saying Sunday the suspected gunman shouted anti-Semitic threats as he opened fire. Charging documents said the suspect, Robert Gregory Bowers, armed with an AR-15 assault rifle and three handguns, wanted all Jews to die and that Jews "were committing genocide to his people," an apparent reference to his belief that a Jewish refugee agency assisting foreign nationals entering the U.S. endangered non-Jews in America. Police officers guard the Tree of Life synagogue following shooting at the synagogue in Pittsburgh, Pa, Oct. 27, 2018. In a message he apparently posted online just minutes before the attack, Bowers, 46, said that the refugee agency, the Hebrew Immigrant Aid Society, "likes to bring invaders in that kill our people. I can't wait while my people are getting slaughtered... I'm going in." United States Attorney Scott Brady, at podium, speaks with members of the media during a news conference in the aftermath of a deadly shooting at the Tree of Life Synagogue in Pittsburgh, Oct. 28, 2018. Scott Brady, the U.S. attorney in western Pennsylvania, told a news conference, "We are treating it as a hate crime." 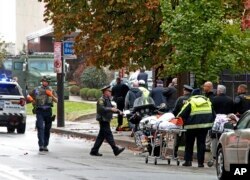 First responders are seen at the Tree of Life Synagogue where a shooter opened fire, In Pittsburgh, Pennsylvania, Oct. 27, 2018, causing multiple casualties. Officials said eight men and three women killed, ranging in age from 54 to 97, and six were wounded, including four police officers, before Bowers was tracked down, shot and apprehended. Bowers was hospitalized in fair condition with multiple gunshot wounds, authorities said. He was charged with 11 counts of criminal homicide, six counts of aggravated assault and 13 counts of ethnic intimidation. The FBI said Bowers was not previously known to law enforcement, but apparently had posted a string of anti-Semitic threats online, particularly on the Gab.com website, where conspiracy theories are common. On top of Bowers's page, one quote said, "jews are the children of satan," according to screenshots of the now-suspended account released by the SITE Intelligence Group, which tracks extremist views. Authorities said they found victims at three locations inside the synagogue, located in Pittsburgh's Squirrel Hill neighborhood. The local medical examiner, Dr. Karl Williams, said, "Lots of shots were fired, there were casings everywhere." "We are devastated," said the group's head, Jonathan Greenblatt. "Our hearts break for the victims, their families, and the entire Jewish community." Gideon Murphy places a flower at the Tree of Life Synagogue in Pittsburgh, Sunday, Oct. 28, 2018. The White House has ordered all U.S. flags on government property to be flown at half-staff through Wednesday "as a mark of solemn respect for the victims of the terrible act of violence." World leaders denounced the attack, deploring it as an affront to humanity. U.S. President Donald Trump told a political rally late Saturday, "This evil anti-Semitic attack is an assault on all of us. We must stand with our Jewish brothers and sisters to defeat anti-Semitism and vanquish the forces of hate." On Twitter, Trump said, "All of America is in mourning over the mass murder of Jewish Americans at the Tree of Life Synagogue in Pittsburgh. We pray for those who perished and their loved ones, and our hearts go out to the brave police officers who sustained serious injuries. 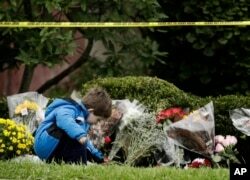 This evil Anti-Semitic attack is an assault on humanity. It will take all of us working together to extract the poison of Anti-Semitism from our world. We must unite to conquer hate." Former U.S. President Barack Obama said, "We grieve for the Americans murdered in Pittsburgh. All of us have to fight the rise of anti-Semitism and hateful rhetoric against those who look, love, or pray differently. And we have to stop making it so easy for those who want to harm the innocent to get their hands on a gun." Pope Francis at the Vatican called the massacre an "inhuman act of violence." He prayed "to help us to extinguish the flames of hatred that develop in our societies." 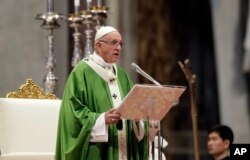 Pope Francis delivers his speech during a Mass for the closing of the synod of bishops in St. Peter's Basilica at the Vatican, Oct. 28, 2018.
they were Jews. On my behalf, on behalf of the government of Israel and the nation of Israel I convey our heartfelt condolences to the families that have lost dear ones. We all pray for the speedy recovery of the wounded." 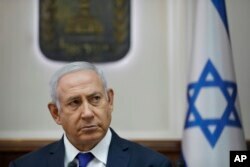 FILE - Israel Prime Minister Benjamin Netanyahu attends the weekly Cabinet meeting at his office in Jerusalem, Oct. 7, 2018. German Chancellor Angela Merkel called the assault an act of "blind anti-Semitic hatred," while United Nations Secretary General Antonio Guterres called for a united world effort "to roll back the forces of racism, anti-Semitism, Islamophobia and other forms of racism."